Caring For Creatures’ goal is to place as many of our animals as possible into loving and responsible homes. 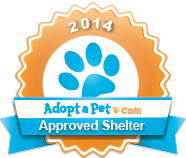 Our adoption process is thorough and we make every effort possible to correctly match animal and human. If you are interested in adopting one of the CFC dogs or cats, the first step is to complete our Adoption Application. You can fill out the adoption form online or you can print the form from the website, complete it, and fax it, mail it, or bring it to the sanctuary. If CFC receives more than one application for an animal, the applications are considered in the order they are received. If more than one adopter is a good match for the animal in question, the application received first will be selected. You may fax your Adoption Application to: (434) 842-1308. Adopters are required to sign an Adoption Agreement. ADOPTION FEES: Cats: $75, Dogs: $125. For unaltered animals (typically this would include kittens and puppies), $25 of this fee is refundable to adopter when the spay or neuter procedure has been done. In order to receive the refund, Adopter must have the procedure completed on or before the date designated in their Adoption Agreement. Refund will be mailed once CFC receives the “Written Statement of Sterilization By Licensed Veterinarian” provided at the time of adoption. CFC is vigilant in following up with adopters to confirm the spay/neuter procedure has been completed on a timely basis! As a not-for-profit charitable foundation, Caring For Creatures operates solely on donations. Without the help of many individuals we could not continue our work. Your tax-deductible donations to make a difference and we put every dollar to very good use. If you are able to assist us in our work, please call, email, or write the sanctuary. Ask us about the Sponsorship Program, Charlie’s Gift, a special emergency fund, and our group of Providers.